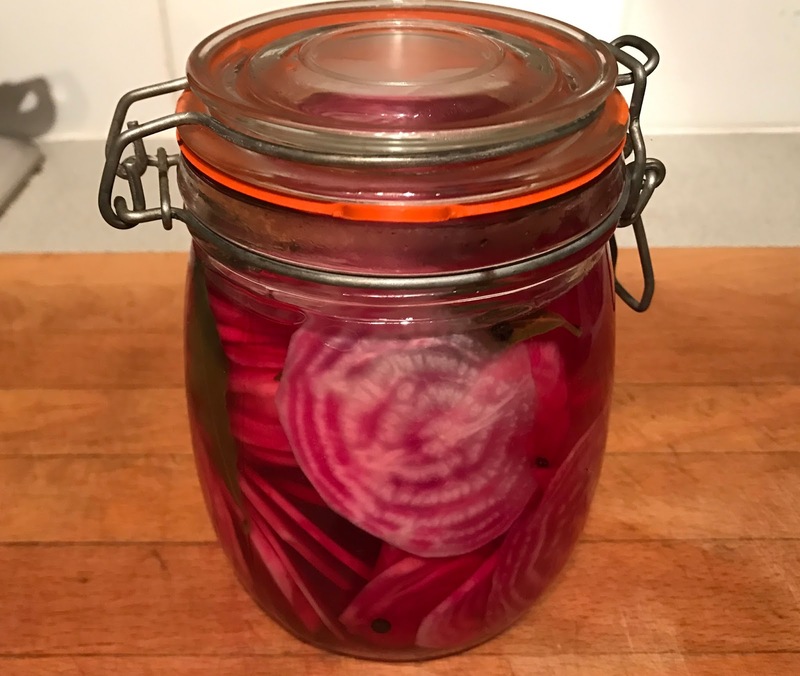 I'm still fairly new to pickling and in fact preserving as a whole, but with such a glut of gorgeous beetroots at the moment I thought what better way to extend the joy of eating them then to make a pickle. In previous years I've pickled onions and shallots but never really out of necessity, more for the fact that I enjoy them with a ploughmans. I've also dabbled in jams and chutneys following a successful day at a pick your own farm or a seasonal glut of courgettes (as I'm sure a lot of us experiencing at the moment). So with what little knowledge I have got and with Pam Corbin's River Cottage handbook to hand I thought I'd be a bit experimental and make it up as I go along. Many beetroot pickle recipes would call for you to cook the beetroot before preserving; this year I haven't cooked a single one preferring to pick them slightly smaller and slice thinly in salads to keep the fantastic stripes that the Barbabietola di Chioggia have running through them. As with standard recipes I heated enough distilled malt vinegar to fill the jar and added three heaped teaspoons of sugar to take some of the sharpness away. Whilst this was coming to the boil I packed the sliced beetroots into the jar fairly tightly to maximise space. To the vinegar I added some whole black pepper corns and a few bay leaves from the tree in the back garden. 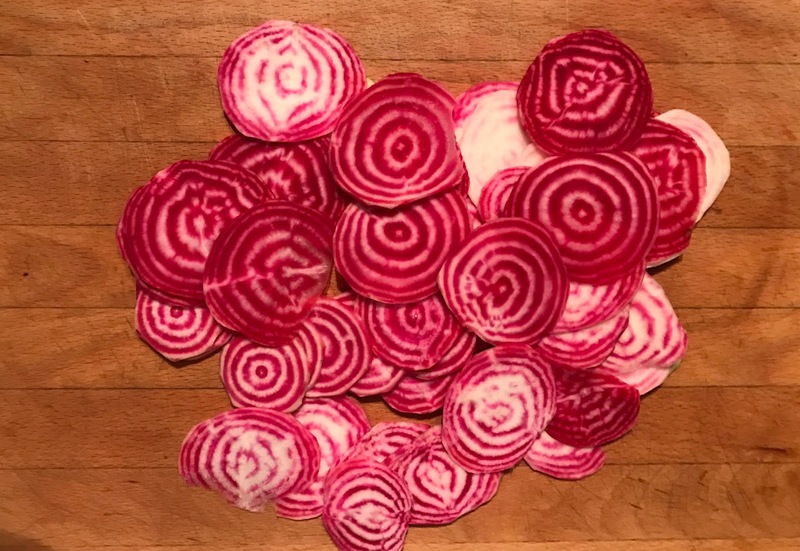 This was all poured into the jar whilst still hot ensuring that the beetroot was fully covered. 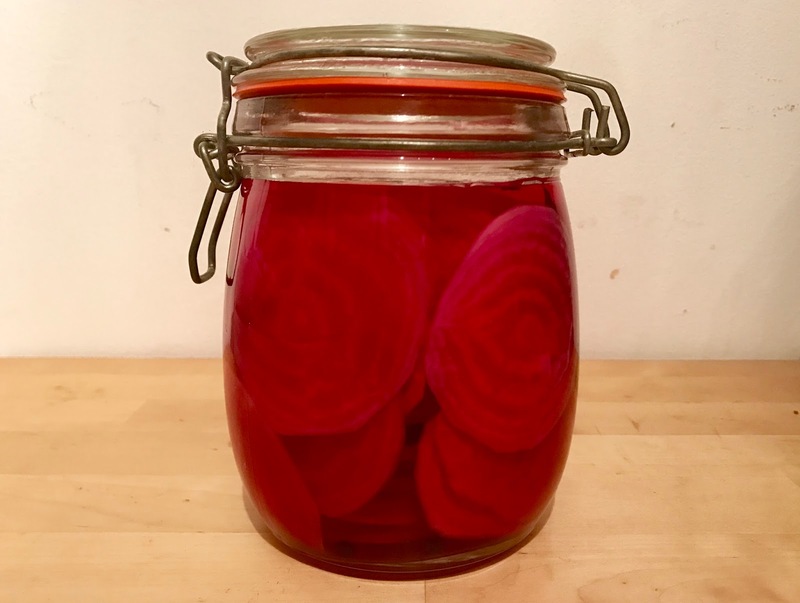 The intention is that by pouring it in hot and then sealing the jars, it may slightly soften the beetroot along with the actual pickling in vinegar itself. The end result looks great and exactly as I had imagined. After a day the beetroot has coloured the vinegar an almost fluorescent pink which is far more attractive than a dark brown jar on the shelf. 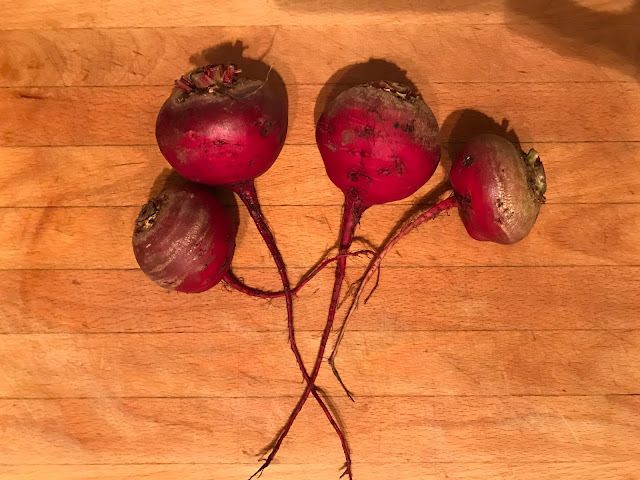 Hopefully, when it comes to eating, the beetroot will still retain it's earthy flavour along with picking up some of the sharpness and sweetness of the pickling solution. Whether or not it will retain it's crunch I don't know but I'd like there to still be a bite to it. Imagine a single slice on cracker topped with cheddar or couple of slices finely shredded in a leftover roast pork sandwich; I'm already salivating!